Buhari, against common-sense, has approached a Federal High Court sitting in Abuja to revoke the bail granted the leader of the Indigenous People of Biafra, IPOB, Mazi Nnamdi Kanu. On Friday, August 25, 2017, the Attorney General of the Federation, AGF, and Minister of Justice, Abubakar Malami, SAN, asked the Federal High Court sitting in Abuja for an order revoking the bail granted Kanu on Tuesday, April 25, 2017. It wants Kanu to be re-arrested and committed to prison pending his trial for treason. Their grounds for the revocation of the bail, re-arresting of Kanu and committing him to prison are that he has violated his bail conditions. As already mentioned, Kanu was granted bail on Tuesday, April 25, 2017, by Justice Binta Nyako of the Federal High Court in Abuja. His bail conditions were so stringent and unprecedented that many thought it would be practically impossible to meet. He was required to provide three sureties in the sum of N100 million each. Of the sureties, one must be a senior highly placed person of Igbo extraction such as a senator. 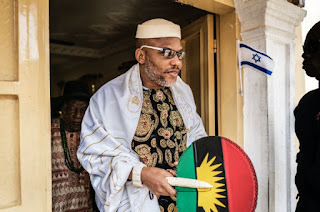 The second must be a highly respected Jewish leader since Kanu’s religion is Judaism, and the third must be a highly respected person who owns landed property and is resident in Abuja. Also, he was required to deposit his Nigerian and British passports with the court, and provide the court with reports on the progress of his health and treatment on a monthly basis. The IPOB’s leader bail conditions included that he must not hold rallies, must not be in a crowd of more than 10 people and must not grant press interviews. From the onset, Kanu had maintained that parts of his bail conditions violated his constitutional rights. These are the aspects dealing with holding or attending rallies, being in a crowd of more than 10 people, and granting press interviews. Constitutionally, these bother on freedom of association and peaceful assembly, and freedom of expression and press guaranteed under sections 40 and 39 of the Constitution of the Federal Republic of Nigeria, 1999, (as amended), respectively. Already, the IPOB leader has challenged these prohibitive and discriminatory conditions in court through an application dated July 1, 2017, and filed at Federal High Court in Abuja by his counsel, Attorney Ifeanyi Ejiofor. So, one wonders why AGF, Malami should be in court, asking for the revocation of Kanu’s bail. in Abuja does not bother about the rule of law. If it operates by the tenets of the rule of law, then, it ought to have released Nnamdi Kalu when Justice Adeniyi Ademola of the Abuja Division of the Federal High Court ordered that he be released unconditionally from illegal detention on December 17, 2015. If the Buhari regime had respect for the rule of law and even-handed justice, then, it would have by now rounded up the authors of Kaduna Declaration for their genocidal call against the Igbo living in the North, and commenced their prosecution in earnest instead of Malami saying that they couldn't arrest them, because of the security implications. Malami’s statement makes one wonder if there are no security implications in re-arresting Kanu. Further, if this government had respect for the rule of law, it would have also by now sought out the composers of anti-Igbo songs for genocide and those circulating them and prosecuted them. This government has not attended to any of those serious and credible security threats to a huge section of its population, the Igbo. Rather, it wants to re-arrest a man, who is leading a non-violent organization that is seeking for self-determination for his people in a struggle against manifest injustices and genocides perpetrated against them since 1945. Since the Federal Government initiated the move to re-arrest Kanu, voices of reason rang out in condemnation of it. Mr. Nnia Nwodo, the President-General of Ohanaeze Ndigbo, in a courageous statement on Saturday, August 26, 2017, said he was amazed that the distinguished attorney (Malami) is prepared to contest the superiority of the provisions of the Constitution on fundamental human rights of freedom of movement and freedom of association over an erroneous judicial proclamation violating those rights. Further, Mr. Nwodo described Malami’s action as biased, insensitive and misdirected, citing his inability to bring to book Arewa “Youths” who issued quit notice to the Igbo in the North. In their own reaction on Sunday, August 27, 2017, the Afenifere, the Yoruba socio-cultural group speaking through its Publicity Secretary, Mr. Yinka Odumakin, said the idea of re-arresting Kanu will overheat the polity, more so when youths in the north that issued a notice to quit were not arrested, even after the Kaduna State Governor and the Vice President ordered their arrest, he said the police did nothing. He posited that the government was engaging in double standard, by giving the impression that what is red line for someone from a particular region is green line for someone in another part of the country. The group advised the government to engage to bring down the tension rather than strong-arm tactics that would overheat the polity. Government to re-arrest Kanu. 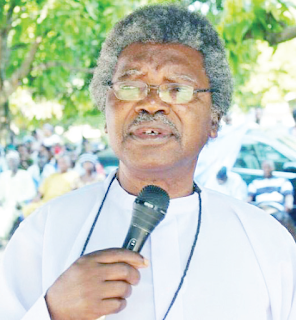 Unongo has countered Nwodo’s position, accusing him of condoning criminality. 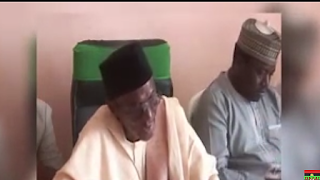 Others who have expressed support for the move are Alhaji Tanko Yakasai, Senator Joseph Waku and Alhaji Abubakar Tsav. They expressed their support through separate interviews granted to the Vanguard and published on Tuesday, August 29, 2017. Instructively, these people have never risen in strong condemnation of the Arewa “Youths” since Tuesday, June 6, 2017, when they issued a quit notice with its attendant genocidal intent to the Igbo resident in the North. They’ve not strongly risen in condemnation of the anti-Igbo songs for genocide against the Igbo in Hausa that is being widely circulated in the North. Yet, they are quick to back the re-arrest of someone leading an organisation a Nigerian court has pronounced as lawful, and an organisation seeking for self-determination through a referendum, an internationally recognised instrument for such quest. It’ll not be wrong to assume that these people are some of the forces behind the Arewa “Youths”. It’s not as if the Federal Government and those backing it to re-arrest Kanu are unaware of the possible consequences of their action. It’s just that they believe they can contain it with the help of the lopsided security forces. Throwing all caution to the wind in this matter is dangerous. And it has to be clearly stated that re-arresting Kanu while leaving the "Arewa Youths” to roam free is a declaration of war. The UN must now do the needful by urgently supporting the call for a referendum in Nigeria to avoid a looming catastrophe.